This is great. Let's do this thing! We will also be investing in programmes that bring sustainable change to the school and community. ‘More people die from unsafe water than from all forms of violence, including war.’ - Ban Ki-moon - then Secretary-General of the United Nations. Access to clean water will improve health and precious funds used to buy expensive bottled water can be invested in education. Insufficient sanitation has caused the spread of disease and even prevented girls from attending school. This cannot continue. We will be providing girls with sanitary products and empowering the community to build more latrines. We’re working with a team of experts to improve nutritional and healthcare knowledge and awareness. We are working to ensure the local primary school not only meets the statutory requirements, but goes further. Where you live should not determine the level of education you are entitled to. We want to help develop an exceptional syllabus that enables children to fulfil their unique potential. Many of the families we work with are unable to provide regular meals for their children. They often have to choose between food and clothes, or food and education. We want to ensure that children receive at least one good meal every day. The majority of teachers we are working with have only received informal training. We will help them to develop pedagogy skills and confidence to improve education and increase admissions. Ultimately, well trained teachers provide better, and more sustainable, education. The hard bit. Choosing a cup! ‘My coffee’s keeping kids in school’ - because it is! ‘My coffee’s training teachers’ - because we’ll be investing in the teachers so that they can better educate children for many years to come. Our reusable travel cups not only look great… they are! In the UK alone, we dispose of 2.5 billion paper cups every year! Using reusable cups is the perfect way to reduce our impact on our precious planet. 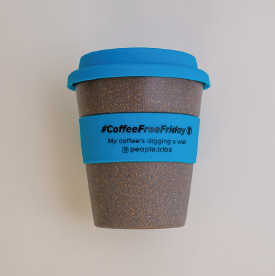 Our bamboo #CoffeeFreeFriday cups are also compostable. Once your cup has earned its eternal rest (we recommend after one or two years depending on usage), you should break up your cup, soak it in boiling water and bury it in your compost. The silicone lid and grip can be popped in the recycling.